Seoladh an chéad fhoclóir Ghaeilge LADTA (LGBTQ) an Céadaoin seo caite anseo i DCU. Foclóir téarmaíochta bainteach leis an phobal LADTA atá i gceist leis. Is chomhoibriú idir Aontas na Mac Léinn in Éirinn (AMLÉ), BeLonG To Youth Services, agus an Transgender Equality Network of Ireland (TENI) le tacaíocht ó Joe McHugh é an tionscadal seo. Bhí Cearbhall Turraoin, ball de bhord TENI ag caint ag an ocáid chomh maith. “Cuirimid fáilte roimh fhoilsiú ‘An Foclóir Aiteach’ mar éacht sainitheach maidir le haitheantas inscne, léiriú inscne, agus claonadh gnéis in Éirinn.” Mhínigh sé freisin an aidhm agus an sprioc a bhí thaobh thiar den tionscadal seo, ”béim ar an bheocht agus ar an uileghabhálacht a bhaineann leis an teanga maidir lenár n-aitheantas agus ár bhféinléiriú.” Luaigh sé go bhfuil Éirinn mar tír chun tosaigh maidir le cearta LADTA ach nach raibh baint le sin lenár náisiúnachas nó teanga na tíre agus go raibh deighilt idir an dá. Tá go leor oibre déanta ag AMLÉ ar cearta LADTA go dtí seo le tionscnamh cosúil le Pink Training. Bunaíodh an tionscadal sin i 1992 agus inniu is é an ocáid is mó den sórt sin sa tír do mhic léinn Triú Leibhéal é. Ba é an mana léirithe leis an foclóir aiteach nua ná ionadaíocht i dteanga na Gaeilge agus is é sin atá mar chroílár an feachtasaíocht agus obair go léir a bhíonn á dhéanamh ag AMLÉ. Mar ollscoil a chuireann uileghabhálacht agus comhionannas chun cinn is oiriúnach gurb i DCU a seoladh an foclóir úr seo. Tá cumann LADTA beo bríomhar mar chuid den ollscoil a chuireann ocáidí iontacha cosúil leis an comórtas banríon draig ar siúl do phobal na hollscoile. 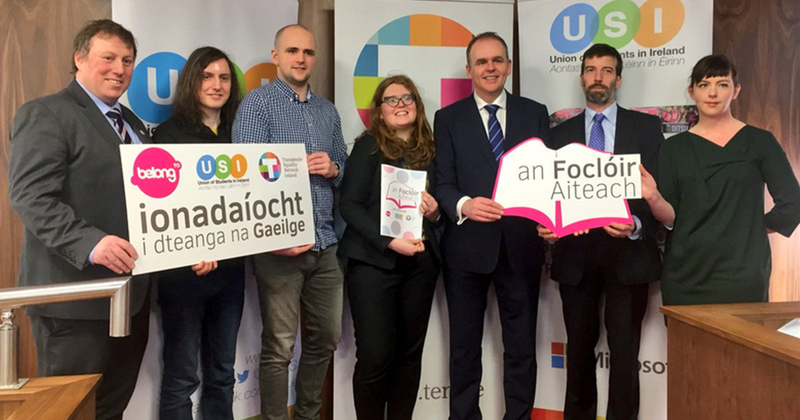 Tá an foclóir aiteach ar fáil saor in aisce ar líne ar suíomh AMLÉ http://usi.ie/focloir-aiteach/ agus tá breis eolais faoin tionscadal ar fáil ann comh maith. Níl an foclóir seo bainteach leis an gCoiste Téarmaíochta nó le Focal.ie. Ba mhaith liom an deis seo a thógáil mo bhuíochas a gabháil libh uilig. Is é seo an t-eagrán deirneach faoi mo chúram. Bhí bliain iontach agam mar eagarthóir Gaeilge. Tá go leor foghlamtha agam agus neart deiseanna iontacha faighte agam le linn mo thréimhse mar eagarthóir. Go raibh míle maith agaibh na léitheoirí ach na scríbhneoirí ach go háirithe. Gan na scríbhneoirí iontacha ní bheadh an roinn Gaeilge álainn atá againn sa College View. Go n-éirí go geal leis an chéad foireann eile. Don uair dheirneach, Slán agus Beannacht.